For the first time in the relatively long history of Headland Sculpture on the Gulf, I chose to create a work for the temporary coastal exhibition. Artists were asked to create new and site specific work exploring the fabric, history or contemporary use of Waiheke Island. 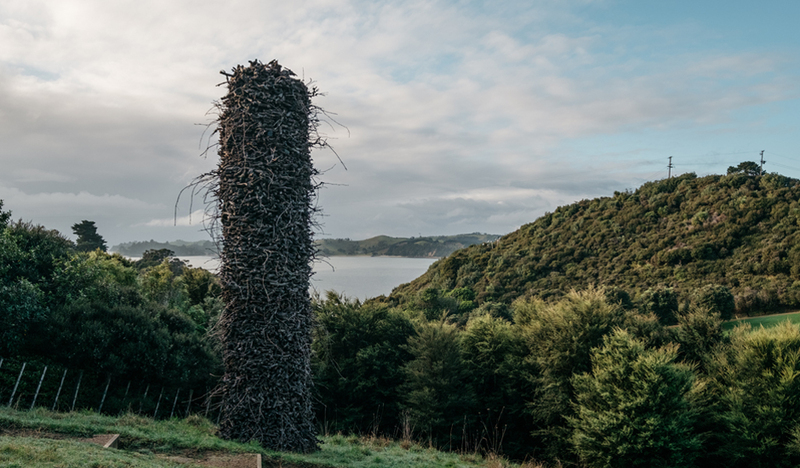 Waiheke is famous for its wine growing industry and early inquiries established that there would be both prunnings and grape vine trunks available at the right time to create a living sculpture. Kinetic Fungi Tower became my first public living sculpture in New Zealand. With the assistance of volunteers, 16 cubic metres of grape vine cuttings was accumulated at my site high up on the ridge overlooking the Hauraki Gulf with Auckland city in the far distance. It took three weeks for six volunteers and myself to carefully construct this seven-metre tower of gnarly grapevine trunks. It will take over 70 years for the fungi to decompose the tower. After the exhibition the sculpture was totally reconstructed at Connells Bay Sculpture Park on Waiheke Island.